Ten years ago, Robert Kirkman started a cultural phenomenon. Even though the market for zombie stories was saturated, he created a story which has resonated with millions. What started out as a small independent comic has now become a multimedia brand that, in turn, has become a house hold name. So, how does Kirkman celebrate ten years of undead awesomeness? He puts our beloved characters into their most dire situation yet. He starts an All Out War. We are excited for the upcoming months of The Walking Dead, and we want to share that excitement with you. 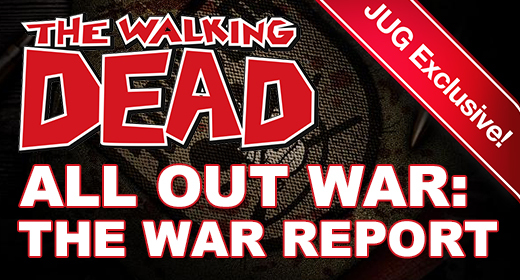 Starting on September 30th we will be your Number One Source for The Walking Dead: All Out War information. I am excited to announce that we will be covering every angle of All Out War with our War Report series. On September 30th we will begin The War Report by looking into the past at different people, relationships and locations that will most likely have an impact on the war. You can expect an article every day at that point leading up to the release of The Walking Dead #115. Once the All Out War is started, I will review each issue for my weekly comic review on the Fridays after release, but we will not be stopping there. Along with the review we will be compiling all of the events and happenings of All Out War. With each issue we will be releasing a separate The War Report article detailing (with spoilers) everything that happened in the issue, along with speculation and theory about what is to come. But wait, there is more. Beyond just chronicling the events, we are going to be compiling information from the All Out War arc on every character, location, event, etc. wiki style. I am a longtime comic reader, and I know how difficult it can be to keep all of the information of a story straight, so we want you to have an easily accessible resource to find exactly the information you need. All Out War is expected to be one of the grandest stories that Kirkman has ever written, and part of the fun of experiencing such stories as they are released is interaction with other members that are part of that story’s community. With that in mind, we would love to hear your theories and speculations about All Out War on Twitter or Facebook. We may even spotlight your theories here on the website. We hope that you are as excited for All Out War as we are, and we invite you to experience it along with us. The JustUs Geeks are your source for all the updates on The Walking Dead, and don’t forget that September 30th marks the first day of The War Report ten day countdown to All Out War.